It has been wonderful to meet with the adults of every member of Thoresby class over the last couple of weeks and share so many good things! It is also brilliant that the children have such supportive families because, as well as sharing information about progress so far, we have been able to talk about targets to help everyone reach their potential. One of the targets that we set is for learning behaviours. We can demonstrate a thirst for learning and make a determined effort in every subject. We can collaborate and cooperate well, being ready to learn at all times. We are highly engaged in all of our lessons. We are highly skilled at managing our own behaviour. We are highly supportive of other learners. We have excellent attitudes towards our learning. 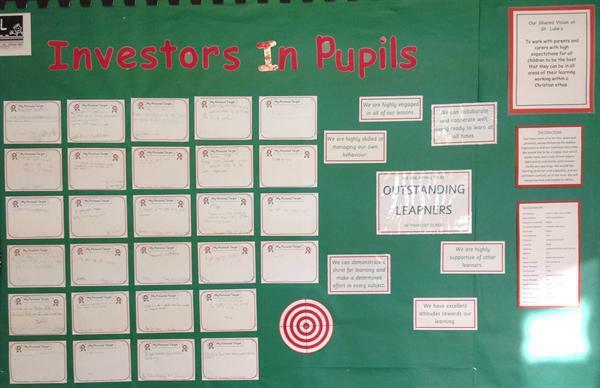 Have a look in our gallery for photographs of our class 'Investors in Pupils' display.